A recent Wired magazine includes an article on "crowdsourcing". This is an Internet phenomenon: the Internet provides access to many, many "amateur" practitioners of a skill, such that they now compete with professionals (and lower the prices available to professionals). The first example is stock photography: companies used to pay hundreds or thousands for small numbers of stock photos, but now there are sources of good digital photos available for stock use at $1 a photo. Why pay a hundred times as much when the "amateur" photos are excellent quality? I believe that a form of "crowdsourcing" has happened to the role playing game industry. Quite apart from the glut of professional products, there are many, many products published by both standard publishers and PDF publishers that are written "by the crowd". Or to put it another way, there are so many fanboys and fangirls willing to write RPG material for nothing or next to nothing, material easy and cheap to find on the Internet, that traditional publishers cannot charge much for their publications, and cannot pay their authors much. Given the amount paid to most writers (as low as two cents a word, and rarely as much as five cents a word), and the lack of royalty payments (RPG books are "works for hire", you're paid a lump sum and that's it), it's impossible for most writers to get a reasonable return on their time. This is particularly true if they test their material in actual gameplay, so usually they don't. This has contributed to the low quality of professional publications. At the same time there are people who love RPGs, who actual play their new stuff, then write it up and contribute it to the world at large. Some of this is likely to be better than much of the quickly-written junk published by the traditional publishers. The result of all this: why buy RPG material, or why buy expensive RPG material when the PDFs are likely to be about as good and are much cheaper? And so the bottom has fallen out of the RPG market, with no prospect that it will ever return--because crowdsourcing is here to stay. It is less likely that this will happen to boardgames, because much of the popularity of boardgames come from the tangible feel of the pieces. You can't put tangible pieces in a PDF, or self-publish them through lulu or xlibris. Though a day might come when there are companies that can mass produce small numbers of tangible pieces to be included in boardgames. Nonetheless there are places like wargamedownloads.com that offer PDF wargames cheaply. Moreover, without much playtesting hardly any game will be worth a hoot. You can write fairly decent RPG material without testing it, but you can't write a good boardgame without testing it. Late last year I started a thread on BGG about fundamental structures of games. The brief version of my conclusions is listed below. Now I'm going to try to go through each of the nine elements and list many of the alternatives that are available to designers for that element. I did Economy in late December, now I’ll try some more. 7. Conflict resolution/interaction of game entities. Adjacent conflict (wargames) often with dice or cards, sometimes with "combat tables"
I've made a "current" list of techniques for making Brit-like games more like Euro or German-style games. Can anyone think of something that might be added? 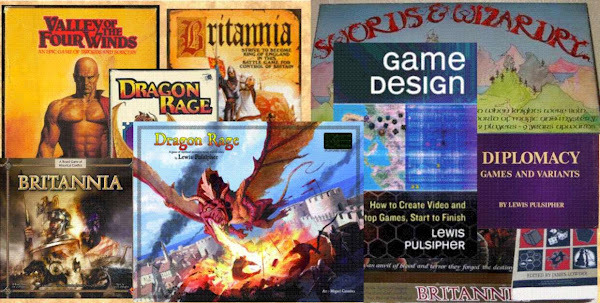 Almost all of these methods are used in "Brit Lite" and have been playtested in that game or another. I use cards for combat, each player playing one (usually); each player has an identical pile of cards, and has a hand of several of those cards at any given time. However, I've found by testing that reducing stacking to one in difficult terrain and two in clear just doesn't work right. 2 and 3 seem to be the minimums. But with fewer areas you can end up with fewer pieces. Also, the "overstack" can be one greater than the normal max, perhaps +1 more if a leader is present.